Have you ever been talking with someone about racial reconciliation, and realized halfway through the conversation that you all are not talking about the same thing? It can be a problem! There are so many preconceptions of what racial reconciliation means and requires, our conversations can start floundering before they start. If we are to proclaim and practice this vision, we must first understand its meaning. After reading through the themes of the book, I'm hopeful this could be a great launching pad for authentic conversation about what it means to engage racial reconciliation. I dont want to read this as an island unto myself. I wonder if we might converse, wrestle, and wonder aloud about the possibilities of this reality. Let me be clear. I have not read this book and have no idea what the coming weeks will bring. I am hopeful that it will produce some great conversations. I believe it has the potential to stretch us if we bring ourselves and our experiences together. We never read a book as blank slates. We bring the stories already written into our minds, hearts and bodies with us. Our realities shape the content, and I want to hear about yours. How could this content work in the world? Lets find out together. No more talking around racial reconciliation. 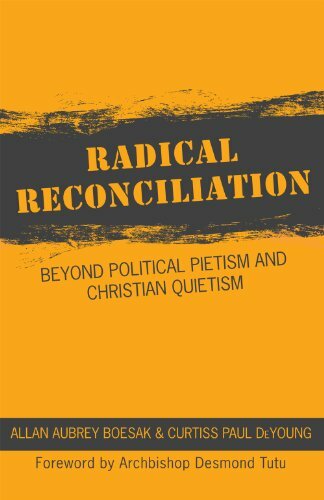 Lets get to the heart of the matter wrestling with the theology of reconciliation. 1. What is reconciliation according to the Bible? 2. How could reconciliation transform our communities? We'll read one part every month (there are four parts). Then we'll gather together here and on social media to talk about how we're learning, discarding or wrestling with the content. Kelley and I will post our reflections here and on social media. Since the authors of the book proclaim that biblical reconciliation is real, radical and revolutionary, we'll use #RealRadRev to keep the conversation going. You can click the image to purchase the book (or kindle version) now!